A variegated sea urchin (Lytechinus variagatus) displaying clipped spines and tube feet in a test for regenerative properties. With a novel regeneration assay, the Molecular Discovery Laboratory found that regenerative ability in sea urchins does not decline with age. 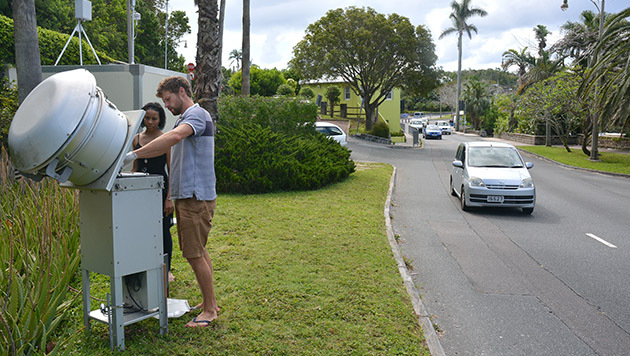 Monitoring Bermuda's air quality at East Broadway in the city of Hamilton. Research Specialist Tim Noyes deploying equipment to monitor water quality. BIOS routinely provides the Bermuda Government with scientific data on the quality of the island’s air and near-shore waters to inform a variety of public health and planning efforts. Since 1987, the Air Quality Program has monitored the sources and concentrations of air pollutants that may negatively impact the health and well-being of Bermuda’s residents. 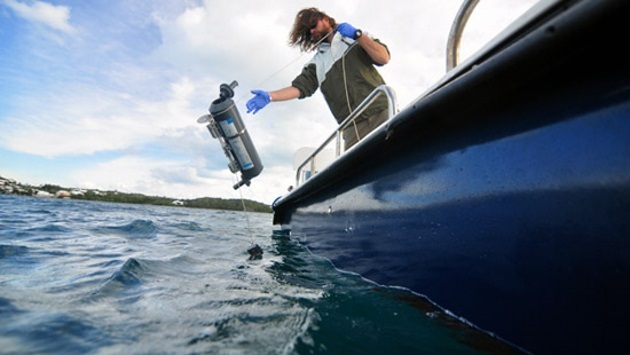 The Marine Environmental Program (MEP) conducts routine monitoring of Bermuda’s near-shore waters to assess known sites of marine contamination and identify new potential sources of pollution. In addition, BIOS has provided environmental research and monitoring capabilities on a variety of topics, including heavy metals in soil and drinking water, persistent organic pollutants, and pesticide residues in groundwater reserves. BIOS researchers are working at the intersection of marine science and biomedicine to advance our understanding of biological processes within the ocean that might have implications for human health. 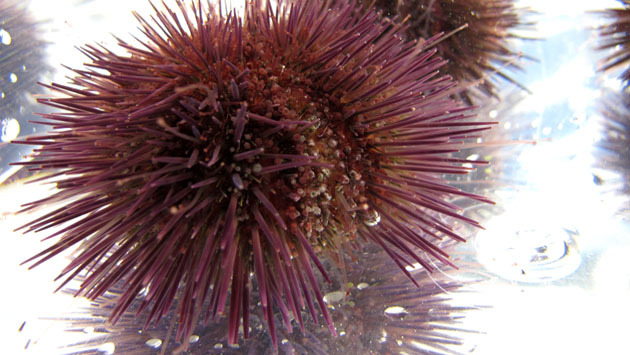 The Molecular Discovery Laboratory utilizes sea urchins and advanced molecular and genomic tools to investigate how long-lived sea urchins appear to escape the aging process while also avoiding age-related diseases such as cancer.